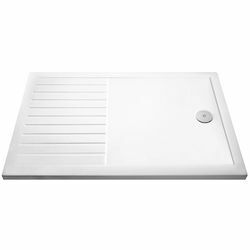 Tuff Trays > Walk In Shower Tray With Drying Area 1700x800mm (Low Profile). Tuff Trays rectangular low profile walk in shower tray in white finish with drying area (1700x800mm). Drying area to help keep water off your bathroom flooring. Strong Durastone construction (ABS poly stone). Size: 1700W x 800D mm.